ABS coming to motorcycle near you soon! I know there’s a big debate on whether ABS makes a motorcycle any safer to operate. I know I could operate my motorcycle without ABS safely. I understand the concept if the tires aren’t rolling during braking, I’m relying on a small patch of rubber to stop me. I hear a lot of people say “you really don’t need that extra crap on your motorcycle.” I’m sure the manufacturers don’t like the idea of adding an extra cost to their motorcycles. So the debate rages on yay or nay. I’m going to go with yes for a whole other reason. There are a lot of people on motorcycles now who didn’t go through the same motorcycle apprenticeship that I did. What do I mean by motorcycle apprenticeship? Let’s run down memory lane here. The first motorcycle derivative I rode was a Briggs & Stratton power mini-bike, somewhere around 3 ½ horse power. It had a friction clutch, rear drum brake, no suspension and no gears. I rode that baby for about four years destroying the backyard. Next on the docket was Honda Mini Trail 50 with a three speed gearbox. I drove that sucker like I stole it for the next two years. Then things got a little serious! I got a Honda XR 75 and drove it around in the dirt against others like a madman. Driving like a madman paid off. I then drove a Honda Elsinore 125 cc against my colleagues in the dirt. I finally hit the big time when my parents equipped me with a Honda Elsinore 250 cc. By the time I got my official Illinois motorcycle driver’s license I had approximately 8 years of experience on motorized two wheel vehicles. Okay, back on track! What really scares me are people going through a 20 hour motorcycle safety class and getting an official Illinois motorcycle driver’s license. 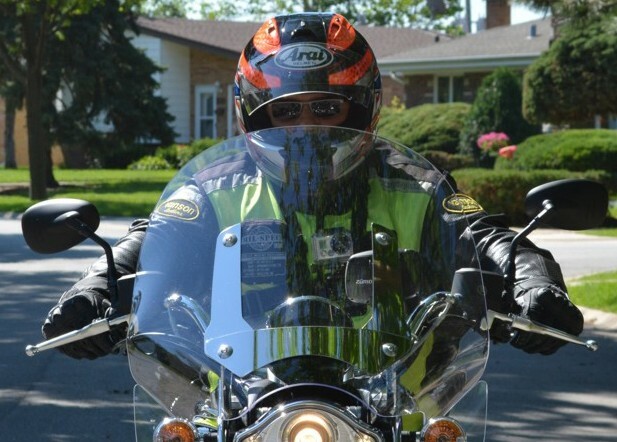 Fifteen of the 20 hours are the actual time spent operating a motorcycle to meet the licensing requirement. So a motorcycle noob drives a motorcycle around in a parking lot for 15 hours and is ready for the big time? I know what you’re thinking, people learn faster nowadays than they used to. They’ve got Google, iPads, online learning and so forth. Riding a motorcycle safely is all about decision-making. Decision-making is all about recalling relevant events contained in memory to solve problems. I’m a firm believer that 15 hours of driving around in a parking lot leaves a person on the low-end of the effective decision-making spectrum. The EU has done some studies showing that ABS reduces motorcycle fatalities. They’re suggesting that motorcycles 125cc and above with ABS could save approximately 5,000 lives. These 5,000 lives would be saved between 2014 and 2020 per the study. The EU is currently working on legislation to mandate ABS on motorcycles 125cc and above. I think it’s time for the manufacturers to look at the studies and realize that equipping their motorcycles with ABS will produce a lot more potential live customers.